Sign In is possibly the most powerful of all the links on the eBay pages, and it will be your first stop if you plan on doing any business on the site. Click the Sign In link in the upper-left corner of the page, and you will arrive at the official Sign In page. When you go to the Sign In page and then sign in, you don’t have to enter your User ID again that day. You can set your preferences to take you directly to your My eBay Summary page. This little timesaver is essential for every eBay user. You can search for items on eBay without signing in, but what fun is that? If you haven’t registered with eBay, you’re pretty much out of luck if you find a great deal on a lamp that’s just what you’ve been looking for — and the auction closes in five minutes! If you’re the only one who uses your computer, be sure to select the box that says Stay Signed In. 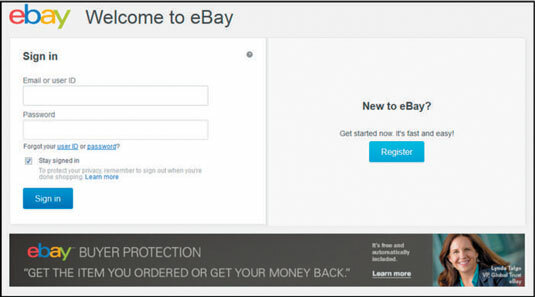 This way, you’re always signed in to eBay within the browser every time you go to the site. The Sign In process places a cookie (a technical thingy) on your computer that remains a part of your computer for the rest of the day. If you don’t select the box, you will be signed in on your computer just for this session. Click the Sign In link at the eBay home page. In the address bar, you’ll notice the URL of the new page that appears is a Secure Sign In page. Select the Stay Signed In box if you’re not at a public computer. If you are using someone else’s computer, remember to sign out when you leave. You’re now signed in to eBay and can transact on the site with ease. When you sign in, you should be brought to your My eBay page. If not, enter your My eBay page by clicking the My eBay link that appears at the top of any eBay page.